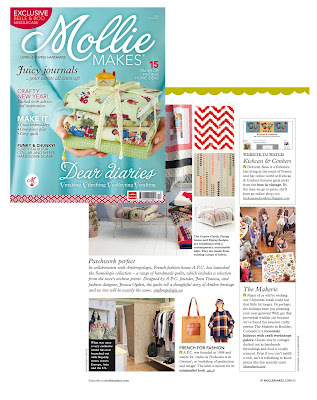 Mollie Makes ~ living and loving handmade ~ has truly taken the crafting publication world by storm. This UK magazine is just full of lovely projects with an equally beautiful aesthetic. They were so kind to feature us in Issue #9 and we were quite thrilled to be included in such an incredible international publication. For those of you coming to the Makerie, I'm excited to share that they are very generously providing each of you with your own copy. Wait 'til you see it! We have a feeling you just might fall in love. And if that weren't enough, their U.S. distributor is also contributing some 'stitch kits' to the goodie bag and our Cozy Creative Lounge. It will be such a fun, interactive addition! For year-round Mollie Makes goodness, take a peek right here and here for print and digital subscription information. We adore Mollie Makes!